Shown above: 1 Zambezi Club Chair, 1 Zambezi Loveseat, 2 Phileep Relaxing Chairs, and 1 Kingsley Wide Reclaimed Teak Coffee Table. This fantastic outdoor wicker collection is warm and inviting and will make your outdoor living space a place where you desire to be all year. This collection includes the Zambezi sofa, club chair, Kingsley coffee table and Phileep relaxing chairs. 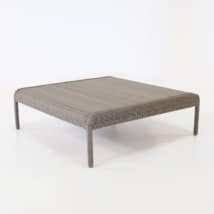 We also carry a matching Zambezi coffee table. The Zambezi outdoor wicker collection is a new look for wicker. 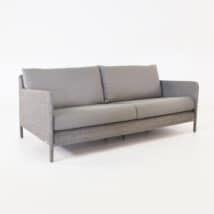 The wide seating area and simple lines of the back and arms give this wicker collection a more contemporary feeling. And the rich, warm colors of the pebble wicker and taupe cushions add that cozy and inviting feeling that you get with wicker patio furniture. The Zambezi sofa, club chair and ottoman are made with Ecolene® outdoor wicker, powder-coated aluminum and Sunbrella® cushions. These materials are perfect for your outdoor garden, patio or porch. Not only are these materials durable, they are also easy to clean. We recommend wiping them down when they do get dusty and that you store them indoors during the harsh winter months. 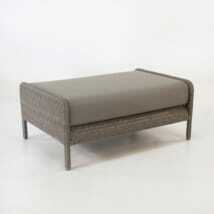 We also offer the Zambezi collection in a chalk (off-white) wicker with canvas Sunbrella® cushions. The chalk Zambezi collection goes beautifully with white and grey accents for a very soft look. It is fun to mix wicker pieces with some of our reclaimed teak accent tables. You don’t always have to go with just one material. Our talented staff are here to help you. Call us or email us today with any questions you might have. We look forward to helping you create your dream outdoor space!